KYOTO, JULY 1998 - Kyoto, city of 1000 temples... On my stay in Kyoto, I visited a few of the most known Buddhist temples and Shinto shrines. Apart from the historical and architectural value, these places are interesting to watch day-to-day life of Japanese people who come here to pray, or who are just on a daytrip. Typically a shrine or temple is a whole complex of gates, stairs, paths, buidings and gardens. Some of the temples are also part of a monastery. In Japan, it is generally allowed to take pictures of everything, also inside temples. 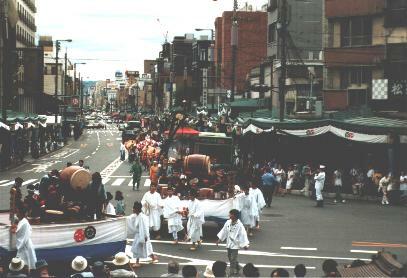 On special days of the year, there is a festival organised. I was lucky to be in Kyoto on the day of the Yasaka shrine festival. To the outsider like me, it all seems a bit chaotic at first look - but in fact there's a clear order in all of this. 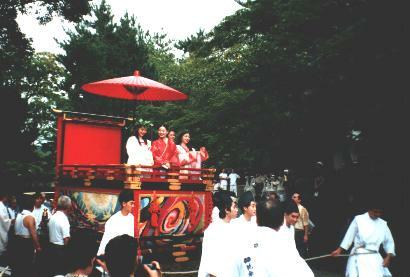 In the morning, the participants all gather inside the shrine complex to form a procession. There's a lot of shouting and moving back-and-forth till everything is organised as intended to be. A lot of (mostly Japanese) tourists take the opportunity to have their picture taken next to some of the participants. The costumes are really spectacular. On the signs of the organisators, the procession then starts moving making a loop through the city. Quite surprisingly, (always busy) traffic is not prohibited during this procession. A lot of spectators are watching all along the route, some people follow the procession. After the one hour or so, the procession returns to the shrine. 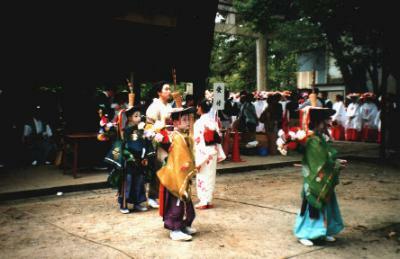 Then the 'performances' start inside the shrine grounds. The place is now filled with people, coming to watch the drumming and the dancing. Again there are a lot of things happening simultaneously, and there is a big crowd. It is amazing to experience such an event. The traditional values of the Japanese culture are clearly present and integrated in the otherwise modern organised Japanese society.